In single-axis applications the Emerald Emax drive can be enabled as a stand-alone position controller and drive combination. Used in a multi-axis Emerald system you use the same programming language when the Emax is networked with the multi-axis EMC-2100 programmable automation controller. 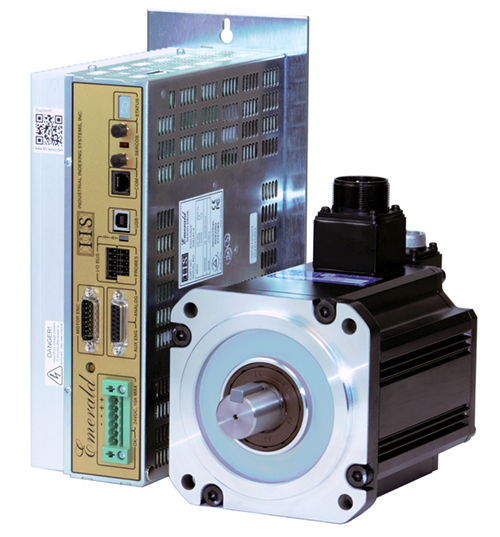 In single-axis applications the Emerald Emax drive can be enabled as a stand-alone position controller and drive combination. As a multi-axis Emerald system you use the same programming language when the Emax is networked with the multi-axis EMC-2100 programmable automation controller. Common drive hardware can reduce spares inventory. The Emerald Series servo drives and motors use the latest servo technology to bring cost effective solutions to the automation market. A wide range of sizes and feature rich functions make the Emerald servo drive the most versatile servo system on the market. This advanced control design minimizes hardware cost while maximizing performance. Analog I/O, one +/- 10 volt input and one PWM style output. Two high-speed position “trap” inputs for storing a snap shot of a encoder position relative to a sensor to provide web or product registration control. The Extended I/O bus will interface up to two Emerald 16 position I/O racks (ESD-IO16) providing an additional 32 I/O points per drive. Two rack types are available to meet AC, DC, low voltage, and high voltage requirements. Seven segment status display for quick fault determination. High-speed digital signal processing (DSP) hardware to control motor position, velocity and torque. USB port for easy interfacing to laptop PC for programming, drive diagnostic and setup procedures. The Emerald EMAX is available in 7 size ranges: 5, 10, 20, 40 and 60 amp @ 220 VAC and 25 and 50 amp @ 440 VAC. Emerald servo motors are available from 400W to 21Kw, 1500 to 3400 RPM rated speeds with low and medium rotor inertia versions.